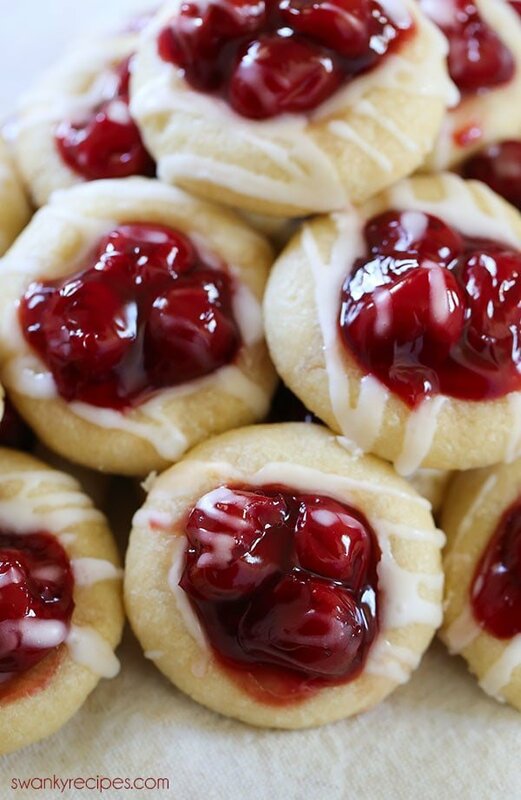 Chewy vanilla and almond sugar cookies filled with cherry pie filling and drizzled with icing. These Cherry Pie Cookies are an easy to make dessert for Valentine’s Day, 4th of July, Mother’s Day, Christmas and just about any other holiday! Love is in the air and it’s the perfect time to make sweet treats for that special someone in your life. That special someone may be your spouse, kid’s or friends and these cookies are the perfect way to show them you love them. Every year it can be hard to come up with a dessert idea to win over that special someone in your life. 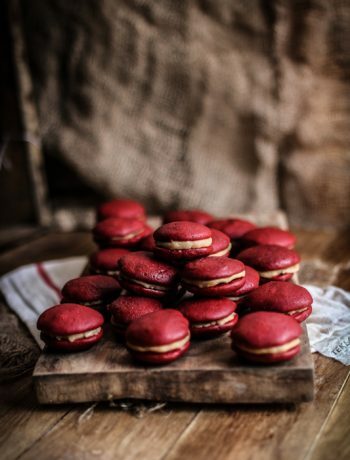 Therefore, I usually stick to a classic dessert and these cookies are a fun treat that’s appropriate for every holiday, especially Valentine’s Day. Sugar cookie recipes are my favorite cookie to make and they are great to give away as a quick gift. I’ve made cute little mason jars filled with the flour and sugar to give to friends. I usually have a few baskets I pick up throughout the year for occasions like this. That way, I can pack the cherry pie filling and a mason jar filled with dry ingredients into the basket. 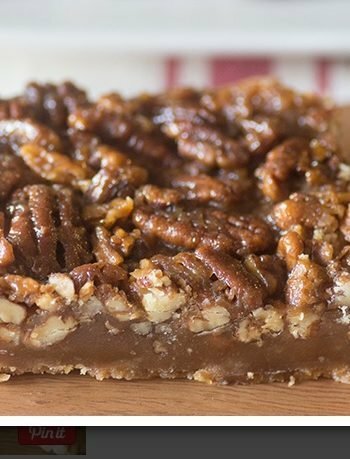 To top it off, I’ll toss in a few jars of my homemade almond and vanilla extract or include special store bought ones from my favorite brands. 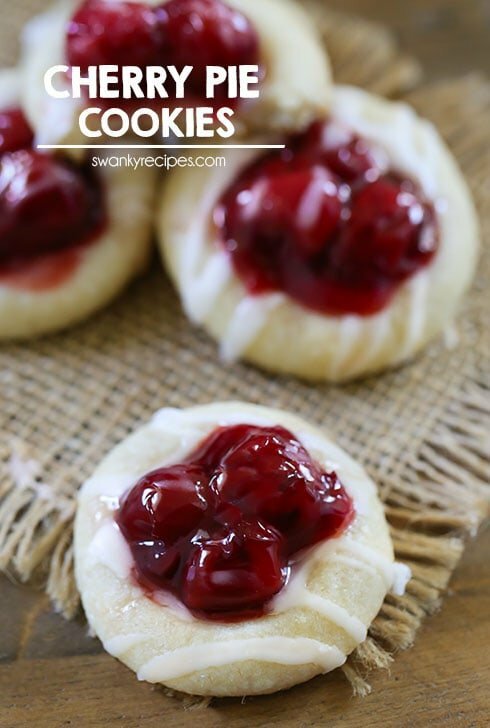 The center of this thumbprint cookie is actually super easy to spoon into the center which makes these cookies the ideal recipe to make for the holidays or any occasion. During summer I like to make my own cherry pie filling to use in desserts but this time I didn’t have any extra on hand. Grocery store cherry pie filling is what I used to fill each sugar cookie. A 21 ounce can will stretch out to all the cookies. This method saves a ton of time and if you’re looking to change up the recipe a little, try different pie filling. I must say that cherry pie is my favorite with this cookie base. If you’re looking for more dessert ideas to share with a special someone, try these Red Velvet Thumbprint Cookies or this Strawberry Cream Mimosa for an easy drink recipe. For a quick breakfast for the family, try these Cherry Cream Cheese Danishes. They use canned cherry pie filling and they are always a hit to make with a quick turn around time! 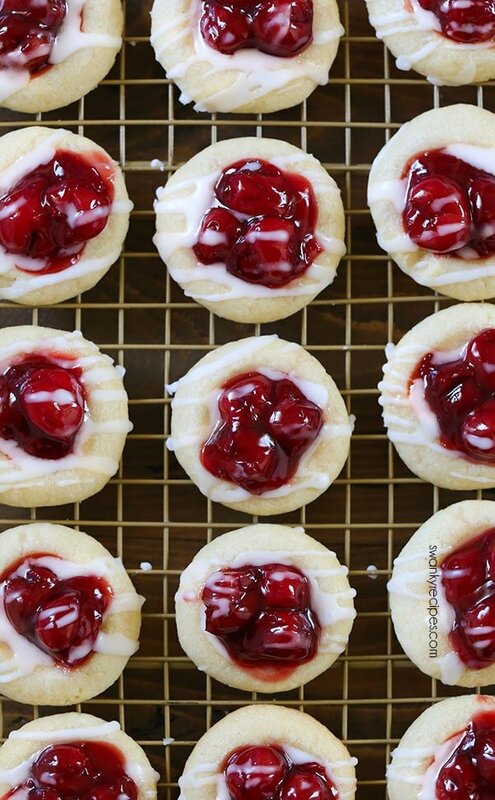 Chewy vanilla and almond sugar cookies filled with cherry pie filling and drizzled with icing. 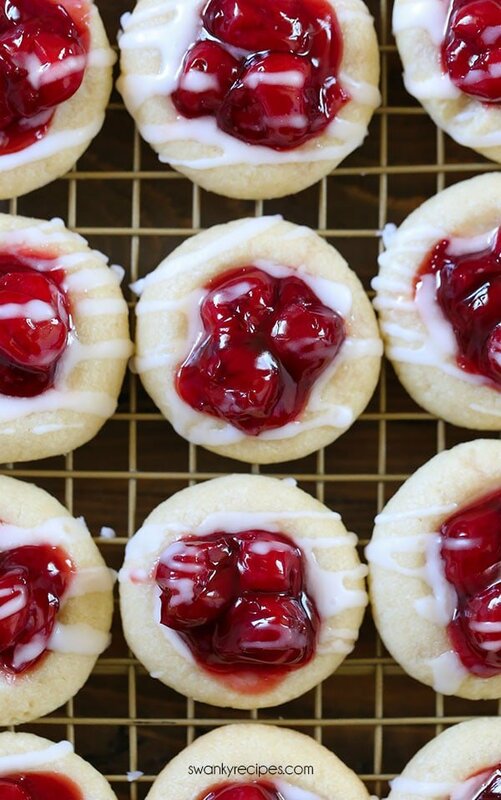 These Cherry Pie Cookies are an easy to make dessert for any ocassion. Line a baking sheets with parchment paper. You'll need 1 to bake cookies and the other to freeze the cookie dough balls in the freezer. 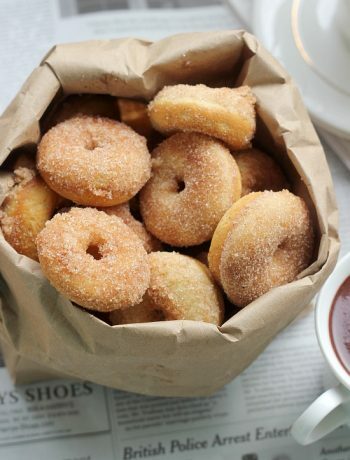 In a bowl fit with a mixer, cream butter, brown sugar, and granulated sugar until light and fluffy; about 30 seconds to 1 minute. Beat in egg yolk, vanilla extract, almond extract, and salt. Carefully beat in flour, 1/2 cup at a time, mixing just until moistened. Beat mixture until combined and dough comes together. You may need to use a spatula to turn the bottom crumbs into the dough then mix again just to combine. Scoop 3/4 tablespoon dough and roll into a ball then place cookie on parchment lined baking sheet. Indent the cookie in the center with a teaspoon dipped in powdered sugar to prevent sticking. Repeat until done. Freeze cookie dough thumbprints for at least 30 minutes. Preheat oven to 375 degrees F. Transfer cookies to parchment lined baking sheet. Place frozen cookies on baking sheet; about 1 inch apart. Fill each center of the cookie with 1 cherry. Bake for 12 minutes. Remove cookies from oven and top with an additional 1-2 cherries. Bake an additional 2 minutes in oven. To make the topping combine powdered confectioners' sugar and water in a small dish. Use a spoon to drizzle over the top of each cooled cookie. I like to place a piece of wax paper below a cooling rack then drizzle the icing over each cookie. So delicate ! Great work ! Pinned ! Thank you so much ! Will pin this one for sure. Sounds delightful!